As in Greek myth, Odysseus is brilliant and versatile. Bring a group of 4 guests and lounge poolside with expansive views of the sea,or take a short drive to explore the shops,eateries and taverns in Lourdas. Unwind in a dreamy master suite with a double bed and attached bath with hydro-massage shower.The 2nd bedroom features 2 twin-sized beds. From either bedroom, step out onto a private, sunny balcony facing the sea. Post-beach clean-up is easy with a 2nd full bath with a jetted tub and a downstairs washing machine. Handmade pottery and original paintings,the work of a dear friend, decorate the living room.The charming kitchen provides all the essentials for a seaside dinner.Or fire up the BBQ grill by the pool.Feast at the dining table,then pour a glass of local wine to savor on the breezy veranda. Our private,traffic-free location makes this an ideal spot for quiet,romantic getaways or family holidays.Find your paradise on Kefalonia! 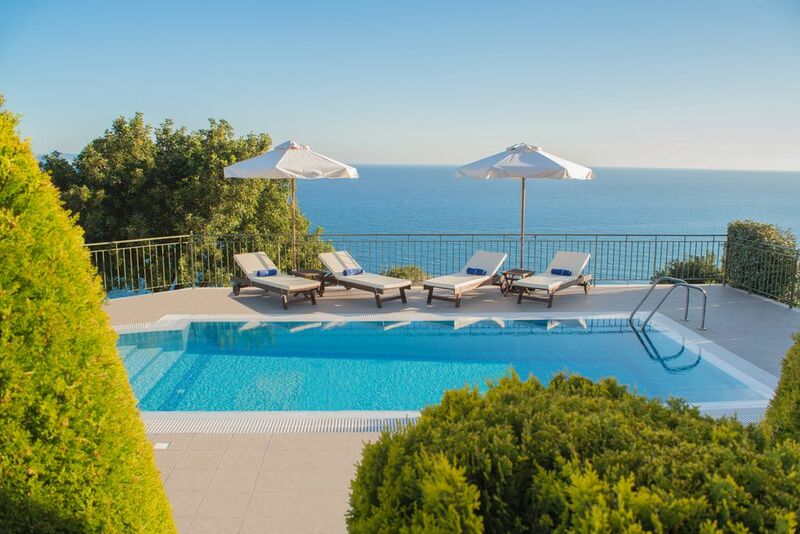 Between the misty mountains and breathtaking coastline of the island of Kefalonia stands two incredible sea-view villas: Villa Odysseus and Villa Penelope. These two nearly identical villas sit side-by-side on the same secluded 4 acres, facing an unmatched view of the Ionian Sea. Rent one to sleep 4, or rent both to sleep 8 and share a holiday to remember. Both villas have their own private swimming pool suspended above the sea. Each also has its own BBQ grill for a truly memorable alfresco meal. Take your place on the sea-view hillside, a peaceful and private location with uninterrupted views of the blue horizon. Close your eyes, feel the warm sun on your skin, and breathe in the sea air. Located at the end of a secluded road, you won’t hear any traffic here...just ocean breezes. Then explore the terrain of this majestic Grecian island. Rent a jeep to see the rugged black fir forests and the wild horses that call these mountains home. Or spend a scenic afternoon renting a small boat and travel to the serene Lefka Beach, located just under your cliff-side villa. Explore the dazzling sea caves via kayak, or take a short six miles drive to sunbathe on one of the most famous sandy beaches on the island, Lourdas Beach. A great beach for families, Lourdas features boat and canoe rentals, jet ski excursions, and more. Drive just two miles and swim in the sparkling waters of Koroni beach. From the villa, drive 10 minutes to the Village of Lourdas, where you can savor delicious local fare and explore the colorful culture. Travel a little further to Argostoli, the energetic capitol 15-miles away where delicious food is around every corner as well, or take a leisurely winery tour. Come find your slice of heaven by the sea! Kefalonia is gorgeous year-round. One of our favorite times of the year on the island is May or September, when the ocean breezes are calm and the temperature is just right. August is another lovely time to visit: take-in the gorgeous full, blue moon through your bedroom windows. There’s a reason our guests return to stay at our villas year after year. Our family-owned properties have been meticulously maintained and cared for, and we live close by and on-hand for any help you may need...or dinner suggestions! Twice a week, while you are out exploring, we will change the linens and clean the villa for you. The villas can accommodate up to 4 adults and a baby up to 2 years old in a baby cot. No security deposit here – we trust our guests! Just a few years ago, me and my family decided to build this villa on this lovely spot. We used to come to this land, gazing at the view, as it belonged to my father and my grand father. Over the past few years that we’ve been renting this villa, we’ve met exciting people and made great friends. My family and me personally manage this property putting into it a lot of effort and our passion. We are only genuine hosts, trying to share with our guests, our love for this place and the island, offering them everything we would like to have, in a home away from home. The privileged and peaceful location of the property, the picturesque surroundings with spectacular sea and mountain views, the privacy that provides make this villa an ideal destination for a romantic holiday or quality time with your family. The villa is decorated with handmade pottery and paintings, gentle contribution of a dear friend of mine. Linens provided and changed twice a week. Free WiFi all over the villa and surrounding area. Towels provided and changed twice a week. For the welcome we provide a bottle of local wine fresh seasonal fruits, milk, coffee, sugar, bread, local cheeses, refreshments, beers and everything that a guest would like to find upon arrival. Fully equipped with plenty of dishes and utensils. The kitchen is fully equipped and provides large refrigerator with freezer. Wooden dining table for six. Taking good care of our guests is our primary responsibility. To achieve that goal, we personally manage our two villas to a very high standard. We do our best trying to meet our guest’s demands and to offer them a relaxing and memorable holiday. Providing a spotless and healthy environment is very crucial to us. Linens and towels are changed twice a week and the villa is also cleaned twice a week. Amenities are provided as well. We always welcome our guests at the airport and honestly assist them in their needs. Pets are not allowed. Early check-in and late check-out, upon request. Security deposit is not needed. Long stay prices on request. Minimum stay: Low/Mid season 3 nights. High season 6 nights. The villa is catered with a welcome pack for your arrival to get you started containing plenty of pantry items such us a bottle of local wine fresh seasonal fruits, milk, coffee, sugar, bread, local cheeses, refreshments, beers and everything that a guest would like to find on arrival. An outstanding villa, well furnished and spotless with fabulous views. The owner of the villa Paraskevas, lives nearby, he is an excellent host and nothing is too much trouble, he provided a fridge full of lovely food and drink, as well as various other little gifts. He is also very knowledgeable about the island, and its attractions. The villa is quite isolated so a car is necessary if you wish to visit the local tavernas. The renowned Lorraine's Magic Hill is a short drive away, and Fiscardo and Assos at the north end of the island are amazing places to visit , beautiful and full of atmosphere. The villa is set in a gated perimeter along with a twin villa and the owner's bungalow. The two villas are completely private from each other. We spent a wonderful relaxing week here and as well as visiting some really good tavernas, we also enjoyed some nights in, watching the sun go down as we dined. We would thoroughly recommend the villa and hope to go back soon. The villas are a 20 minutes drive from both the international airport of the island (direct flights from UK/EU) and the ports of Argostoli (scheduled journeys from Italy via Patra) and Poros (scheduled journeys from Killini) as well as a 30 minute drive from the port of Sami. We always welcome our guests at the airport and honestly assist them in their needs. The villas are situated close to restaurants, bars, supermarkets and gas stations and car rental offices.